That's right, it's not ending with February! 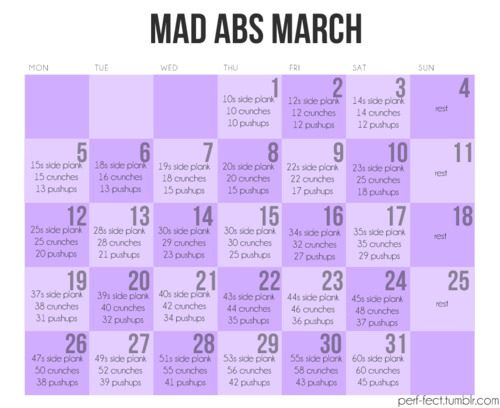 I'm a few days late on the post, but I've started off Mad Abs March strong. I love the addition of side planks because I skimp on obliques way too often. Fab Ab February went quite well, although I missed a few days when we had a visitor and life was feeling super busy. It happens, right? 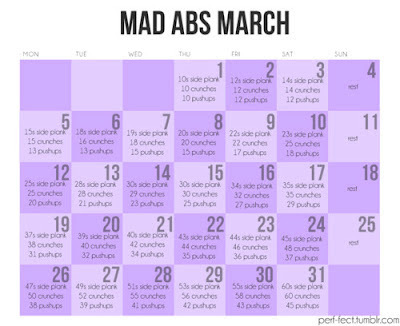 Even so, I'm already feeling better at push ups and love the extra motivation to do ab work daily. Frog Crunches - One of my favorites. Add a medicine ball to the hands for extra weight. Leg raises with scissor kick - This one never ceases to feel hard. I scissor kick as I lower my legs to about 45 degrees and return them to 90 degrees, then raise the hips at the top. I learned this awesome exercise from a class in Ann Arbor. Crunches on the Bosu - Just like it sounds, lay back over the Bosu with feet on the floor or held at 90 degrees. Do crunches. Bicycle - This one is pretty standard but I originally learned it in a Pilates class. Bring one knee in to the opposite elbow, switch. Ball Toss - This is for obliques. Hold torso and legs bent, feet off the ground, by engaging abs. Hold a large exercise/stability ball, turn to one side using the obliques, come to the center, toss and catch. Continue switching. I learned this one from the Ann Arbor class too. I've done it with a medicine ball too. Plank - Everyone knows this one! I like to add raising one foot at a time or reaching one arm at a time for extra work. V-ups - I've done different variations of an exercise by the same name in different classes. My preferred version starts with torso and legs held up with ab muscles, feet off the ground. Lengthen feet and torso, return to starting position. What are your favorite ab exercises? I'm always up for learning more. I don't think I have a favorite, but V-ups are evil (my daughter used to be able to do those forever when she was actively in gymnastics). Great job on keeping with the workout - I'm sticking to the NROLFW at this point. Needless to say, I don't have a favorite ab exercise, but I don't mind planks.